The high-speed, heavy-action Daiwa Saltiga SA-Z Dog Fight Spinning Reel was built to withstand the pressures of heavy braided line when battling large, strong-pulling predators like tuna, amberjack and marlin to name a few. When it comes to reliable pulling power and premium performance, the gimmick-free Saltiga Dog Fight leads the way with a drag max of 66 lbs. and an incredibly efficient line recovery rating—over 50 inches with every turn of the handle! "One thing readers need to know is that you should not put too much line on this reel else line will slip off the reel and make your life very miserable. Once that was figured out this reel worked like a charm." "I have been using this reel for about 6 month and I love everything about this. 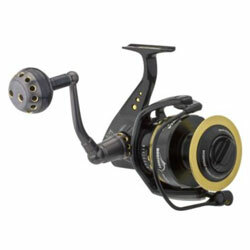 This reel is much much better than New Shimano Stella Spinning reel. Drag is so Smooth. "